Products | Nunobiki Manufacturing Co., Ltd.
Our specialty is small-hole, multi-hole, and wide perforated screens. We push the technological limits beyond what others in the industry claim is impossible and offer products that integrate delicate, advanced techniques. 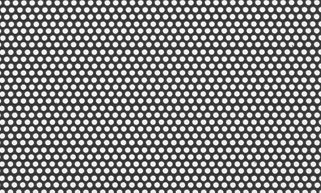 Perforated screens with 4,055 holes 0.25φ per square inch are testament to our technical strength. We make our own dies to produce screens with small holes at a high density. Our most popular perforated screens are used for diverse purposes. Granulators, grinders, filters, centrifuges, dehydrators, food industry, and chemical industry machines, etc. Nunobiki Manufacturing can perforate screens even thicker than the hole diameter, going beyond the traditional limit of perforating sheets thinner than or equal to the hole diameter. Ideal for filtering and dehydration, conveyance purposes, and grinding and stirring. Filters, grinders, centrifuges, ball mills, food industry, and chemical industry machines, etc. We can meet a wide range of needs from a minimum hole size of 0.02mm to a maximum of 1.5mm. For hole sizes between 0.07φ and 3.0φ, the working width differs according to the material, thickness, and hole size. Centrifuges, fluidized bed dryers, sieve shakers, grinders, and feather refining dust extractors, etc. Various strainers, trays for cleaning purposes, speaker nets, etc. Mostly used in air flow conveyors, fluidized bed dryers, and sieve shakers. Air flow conveyors, fluidized bed dryers, rotating-pulsed fluidized bed dryers, sieve shakers, etc. Mostly used in airflow conveyors, fluidized bed dryers, grain stone separators, and distilling columns. Airflow conveyors, fluidized bed dryers, rotating-pulsed fluidized bed dryers, grain stone separators, distilling columns, etc. Mostly used in fluidized beds and sieve shakers. Fluidized beds, sieve shakers, etc. Mostly used in airflow conveyor, fluidized bed dryers, and sieve shakers. Airflow conveyor, fluidized bed dryers, sieve shakers, etc. Various air sliders, flooring, etc. Screens labeled Special above are classified as screens with special holes. Our proprietary techniques ensure uniformity in the height of the hole openings, without error. The combination of multiple hole directions and types can be specified. The open area ratio of the holes is adjustable by section multiple pitches between hole centers can be specified. The perforated area can be specified.